Posted by markus on 2014/05/19 . Leave a comment. How can we talk about the multiple roles expected of, and adopted by, architects? What kind of critique do we expose ourselves to when choosing to work outside of the conventional “office”? What are the biographical expectations that architects face in performing professional personae? 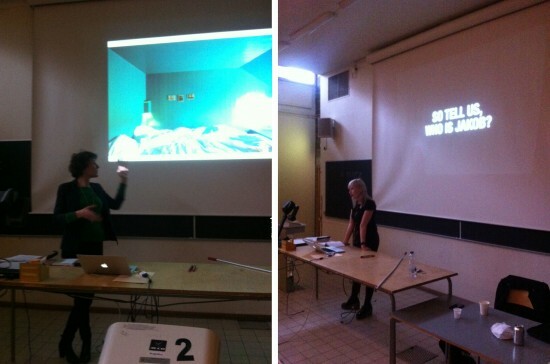 On Friday the 28th February 2014, Karin Matz and Helen Runting of Svensk Standard addressed a lecture to students of the 2nd Year of the Bachelor of Architecture, at the Royal Institute of Technology (KTH), discussing the role of the architect in light of their experiences working in the field. Following a review of their own practices, the two led an exercise in parody and profiling, exploring and exposing the expectations and judgements young architects face in negotiating diverse interpretations of architectural practice. Previous post: (Re)Orientations Course: Whatever happened to the Queens of Pomo?